Sixteen-year-old Mandi Genord hails from Montello, Wisconsin. 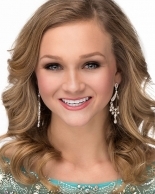 A first-time candidate in the Miss Wisconsin’s Outstanding Teen Competition, Mandi captured the state title and the Photogenic Award. She is a junior in high school junior, where she is on the high honor roll and was awarded the Principal’s Academic Achievement Award. A fourth-generation classical dancer, Mandi began dancing at the age of two and grew up in her mother’s studio. She performed a lyrical dance for the talent phase of the competition. Mandi is a dance teacher and choreographer, and she has studied and/or performed with the Joffrey Ballet, New York City Rockettes and the Milwaukee Bucks Young Bucks. ​As Miss Wisconsin’s Outstanding Teen, Mandi is dedicating her year of service to promoting her personal social impact initiative, “Let’s Move! Combating Childhood Obesity,” while simultaneously serving as a Goodwill Ambassador for Children’s Miracle Network Hospitals, the national charity partner of the Miss America Organization. She was inspired to develop her social impact initiative after witnessing the joy of “being active” among her dance students. She elevated that observation to the next level, giving her students the knowledge and inspiration to live a healthy lifestyle and stay active outside of the studio. Her mission is to educate and encourage children throughout Wisconsin to adopt a healthy lifestyle early on. Upon graduation, Mandi hopes to apply the nearly $3,500 in scholarships earned from the state and national Outstanding Teen competitions toward attendance at the Juilliard College for the Arts. She aspires to become a Radio City Music Hall Rockette.